Another weekend gone, and a few more tournaments under our belts with BFZ. Last weekend was also Game Day for BFZ, and for the most part Abzan, Dark Jeskai, and Atarka Red decks dominated. However, I was relieved to see that a ramp deck (GR Eldrazi ramp) make it to the top 8 as well. This bodes well for the metagame that it has not yet been set in stone and that there are cards we will see more of that we didn’t see that much of in the weeks prior to the Pro Tour. Today is my last article on BFZ standard investments, so lets get started and take a look at what I suggested to pick up last time. 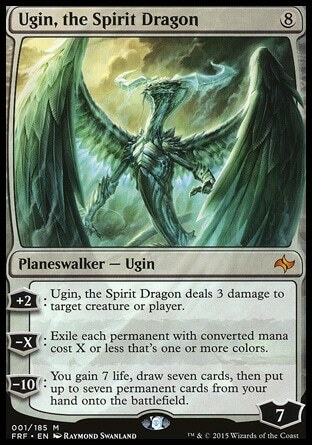 Ugin, the Spirit Dragon – thanks to the Eldrazi ramp decks recently seeing more play (and showcasing the power level of Ugin in a colorful 5 color standard wonderland), he’s finally started to inch up in value to $28.25, which is $1.25 more than he was at during Origins when I said to grab a few of him. A good start. Abzan Ascendancy – I thought the deck would take off in Aristocrat decks, but it hasn’t seen any movement yet since last time. My mistake. 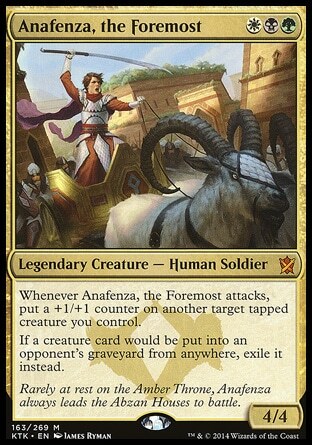 Anafenza, the Foremost – I thought she’d be a good card in Abzan Aggro deck as well as a good card against Rally decks (which were popular at the time), but I never thought she’d double in price to $8.25. I’m surprised and happy that I finished a playset at $4 each back during Origins when I recommended her. 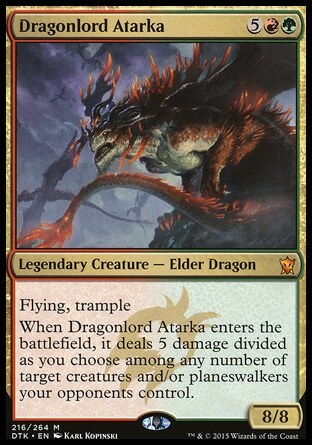 Dragonlord Atarka – I suggested picking him up at $10 due to his overall power level and because I believed that GR ramp decks would once again return after rotation and I was right. He’s only $10.75 right now which is a slight increase, but I expect that price to go up more as people pick up ramp more and more. He’s already buylisting at 1400 yen in Nagoya, Japan. Dragonlord Silumgar – I thought $6 was a good deal for this dragon, but he’s actually gone down to $5 despite Esper dragons still putting up good results. Demand just isn’t there to push the price up. Narset Transcendent – she’s only gone up a little bit to $9.25 from $9, but it’s still an increase. Just as with the ramp cards, I think it’s because control decks haven’t really been solved for the metagame yet. She can be really powerful, especially if UW Awaken control takes off as a premier control deck. Ojutai’s Command – I consider this one of my big wins from my last article. I pushed them when they were $2 during Origins standard (and got my own playset then) and they’ve since showed up a lot more and are pushing $5 at the moment ($4.60). I’ve already sold one of my extra ones at that price to get some profit, but it’s not done yet I think. Sidisi, Brood Tyrant – just a spec, and she didn’t perform well at all last standard so another bad call on my part. Fetch Lands – I parroted most of the other finance people out there that you didn’t want to wait to pick up your fetches during BFZ cause they were only going to go higher in price and I was right Flooded Strand and Polluted Delta would have cost you about $20 during Origins standard but not are $24 and $26 respectively. Looks like everybody was right. Overall I think I did pretty well with my big ticket items, but speculating continues to be harder and harder to do correctly these days. Ugin, the Spirit Dragon didn’t see much play outside of control decks during Origins standard, but with the release of powerful Eldrazi such as Ulamog, the Ceaseless Hunger he suddenly has another deck he can fit into. And it’s not just a sideboard slot either. Ugin will be at least a 3 of in these green, green/red, or green/black Eldrazi ramp decks which means that his $28.25 price tag won’t stay at that price for long. As these decks put up more and more good finishes in this multicolor standard environment, I expect Ugin to hit about $35 before the end of the year. The card has recently increased in price to between 3500 and 4000 yen here in Japan, and I think that will only go up. He sees play in Modern as well, so I think if you’re hesitant that you should at least consider he’s a good investment that you can out during the next Modern season when Tron players are looking for Ugins in their deck. As I stated above, Atarka is seeing a lot more play in GR Eldrazi ramp decks as a secondary threat and is also going to be sticking around after rotation in the spring so I expect Atarka’s value to keep going up in the coming months from her current $11 price tag. He’s buylisting for 1400 in Japan right now, and I think before you know it he’ll be 2000 yen here again and about $15 in the USA. Trade for 2-3 now if you plan on playing any type of ramp in the near future. I’d like to continue recommend Narset Transcendent as well. I think she’ll become a strong force in UW based control decks post rotation and that she’ll go up a few dollars from her current price of $9.25 come spring. Grab 2-3 if you plan on going with those colors. Sarkhan Unbroken ($7) never really found a spot in Origins or DTK standard, and some people say he might never find a deck to fit into. I want to disagree however. RUG decks have been putting up decent results on the backs of Savage Knuckleblade and Thunderbreak Regent, and I’ve been dabbling a bit in a RUG Eldrazi ramp deck that plays him in the sideboard (against control match ups). 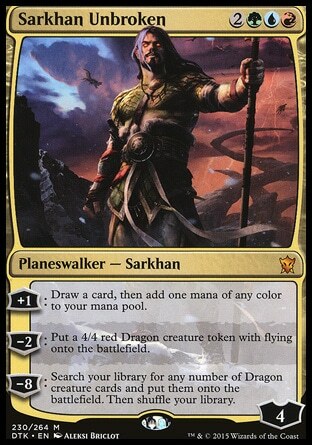 He’s also a DTK card which means he’ll still be around once the KTK Sarkhan, Ugin, and Sorin rotate out of standard. The dragon lords (and Eldrazi for that matter) stand to gain a lot from rotation if ramp does well in the coming months. This is probably going to be the lowest he’s going to be, so I recommend grabbing a few at this price because he could easily double in price on the back of a successful 5 color Dragon deck during Oath standard (because the mana situation is going to be awesome) or do equally as well in a 5 color midrange deck playing all the good stuff from each color like Siege Rhino and Mantis Rider. I see low risk now with a good change for high return (I’ve picked up 3 at $6). Utter End is seeing a lot of play in BFZ standard thanks to harder to destroy cards (Gideon, Ulamog), and it’s not only Esper control and Abzan decks playing it. Dark Jeskai has also started to use the card which means it’s becoming an important staple of this format. This used to be a bulk rare card for under a dollar but it’s already $1.75 and I would expect that price to double by the end of BFZ standard. It will get a lot more play once the second half of the Eldrazi are standard legal I think. Butcher of the Horde ($.50) has been showing up in some 4 color Aristocrat deck as an extra sac outlet and extra power, so if the deck continues to put up good number we might see a slight bump in his price. However, with only a few months left of play I’m not sure if this is good spec target. I’d say grab a playset now if you plan on using them though. It’s only $2 for 4. Another card that fits well in Mardu colors, as well as Dark Jeskai and Abzan red is Kolaghan, the Storm’s Fury. It seems like it was printed all to heck and that it’s price should remain rather low at $.50, but due to its strong finisher power alongside Thunderbreak Regents, Wingmate Rocs, and Mantis Riders I could expect him to see a lot of play and push the price up to $2 or so. I really like Savage Knuckleblade and I think that the card is going to break out before the end of BFZ standard but due to it’s rather limited time left in standard I don’t think it will go that high if it sees play. It’s currently $.50 which is a great price to buy it at, but if it sees a spike I don’t see it going higher than $3 or so. 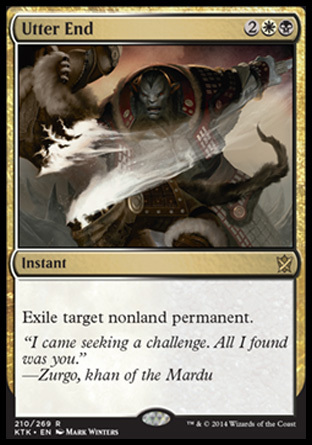 With the UG and UR Battlelands due out in the next set you can bet that Temur will be supercharged and this change will send waves through all of the Temur colored cards like Knuckleblade and Sarkhan. If you don’t have them yet grab them. There’s a good chance it will go up, just don’t expect too much. Silumgar’s Command is the only command that hasn’t gone up yet (Ojuatai’s has recently gone up to $4.50 and probably has another $1 or 2 left in it), and I think eventually it will see some play. It’s popped up here and there in both Sultai and Esper control decks, so I wouldn’t put off grabbing a playset now for $2 before they go up a few dollars after rotation. I’m sure control players will find a way to make them work really well. Two for Ones are never bad, especially at instant speed. Somebody will find a way to play them. Don’t got out and sell Anafenza ($8.50) right away, but look for a peak in the next month or two. Khans of Tarkir will be rotating in Spring next year and this means it the spike she’s experiencing could be her last one. Yes, she does see play in some Collected Company and GBW midrange decks in Modern, but I’m not sure that demand will keep her value above $10. Look for her top price (perhaps $10-12?) and trade her away or cash out if you don’t need the extras. You should be able to grab more after rotation in the spring for half the price she is now I think. Crackling Doom ($3.50) has seen tons of play in the current standard and is showing up in both Dark Jeskai and Abzan Red. It’s also obviously a Mardu Dragons/Mardu Midrange card as well, which means this card should go up another dollar or two before reaching its peak. I don’t think it will be worth that much after rotation in Spring though, so just as with Anafenza look to get out around $5 if you don’t plan on using them in your decks and want some profit. Mantis Rider ($2.75) has also benefited tremendously from the rise of Dark Jeskai and other multicolor decks, since it was merely a $1 bulk not too long ago. Does it have the staying power to be played after rotation though? Due to how many Khans boxes were opened, I think not. I expect it to go back to bulk status in the Spring, so look for an out at $3.50-4 if you’re not using them or planning to use them by Feburary/March. Fetchlands are only going to continue to go up. I expect that the farther we get away from Khans of Tarkir and the closer we get to rotation, the higher the cards will become. We’re looking at a doubling up of their current prices by next summer to the current price level of Zendikar Fetchlands. Expect prices of $40-$50 on each of the cards and don’t be shocked to see them go even higher during Legacy or Modern season. Just some food for though, here are the current BUYLIST prices for the cards here in Nagoya, Japan. These prices pretty much mirror the current SELL price of the cards in the USA, so you can only imagine what stores in Japan are selling the cards at. As for the other lands at this time, I don’t really see a need to pick any of them up. Haven of the Spirit Dragon ($3.50) could see some more play, but I don’t know if we’ll see a resurgence of Mardu, Esper and Temur Dragons all at the same time in standard which should keep the price of the card rather bearable. The painlands have been reprinted all to heck as well, so there’s no need grabbing those either. The main thing you should be focusing on are Fetches. I hope you enjoyed my more compact version of Bang for your Buck, and I also hope that it helps you in making your decisions on what to invest your money in during Battle for Zendikar standard. I think the logic behind this season’s choices are pretty sound, and I’m just sorry I wasn’t able to make my picks sooner. If we learned anything from the last few standard seasons though, it’s that standard is NEVER done. New decks pop up all the time causing certain cards to spike and the best way to take advantage of this is to be sitting on a cheap playset of possible staples beforehand. Being able to out these cards to friends for extra cash, buylisting them at a GP, or trading them on Puca Trade will help you to get ahead. Thanks for reading and if you have any other comments or suggestions about my picks (or would like to make your own for BFZ standard) then by all means post below! See you next time!